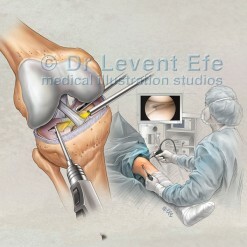 Patient education illustration on the Arthroscopic reconstruction of the Anterior cruciate ligament (ACL). 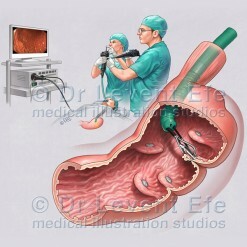 This image sequence is an ideal tool for educating prospective patients before this minimally invasive procedure. SKU: ORT001. Category: Orthopaedics (ORT). Tags: acl, anteriorCruciateLigament, arthroscope, arthroscopy, cruciateLigament, CruciateTear, KeyholeSurgery, KneeArthroscopy, LigamentRupture, PatellarLigament. 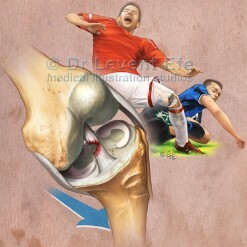 Medical illustration narrating Anterior cruciate ligament reconstruction (ACL reconstruction). 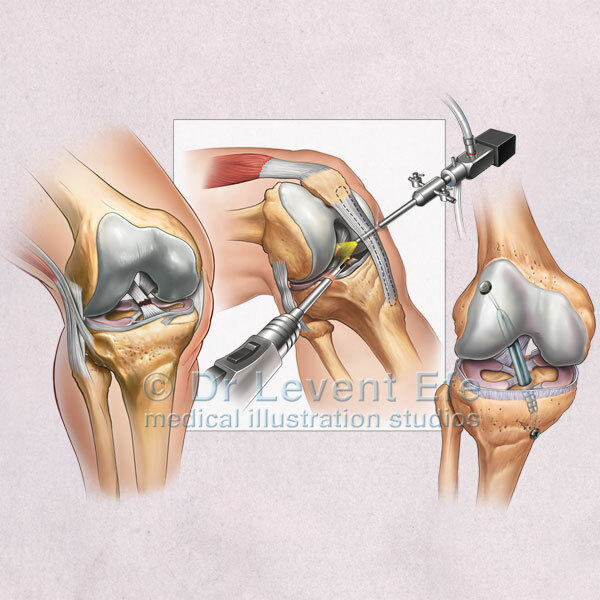 This common arthroscopic procedure is performed for restoring function of the knee after anterior cruciate ligament injury. 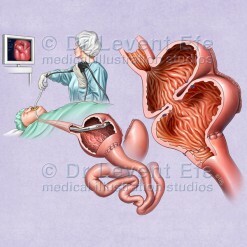 B. Arthroscopic reconstruction. Patellar graft marked. 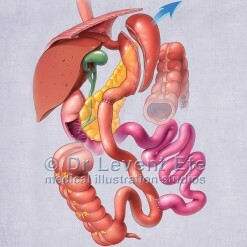 C. Post-operative view, with the surgical tissue graft replacing the ACL.